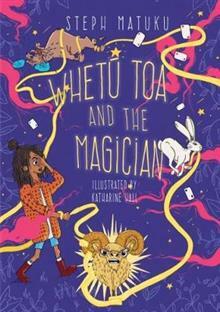 When Whetu's mother takes a job organising a magician's house and farm, Whetu becomes the animal keeper, looking after a golden ram, three lazy pigs, talking horses, a cowardly bull and the magician's stage assistant - an arrogant white rabbit called Errant. Errant's been playing... read full description below. When Whetu's mother takes a job organising a magician's house and farm, Whetu becomes the animal keeper, looking after a golden ram, three lazy pigs, talking horses, a cowardly bull and the magician's stage assistant - an arrogant white rabbit called Errant. Errant's been playing around with magic and created a carnivorous lamb, which he can't change back. Rather than face the magician, Errant disappears and Whetu becomes the magician's new assistant, just in time for the Royal Performance. It all seems to be going well until Errant reappears to seek his revenge, and Whetu must save the day - and the king.